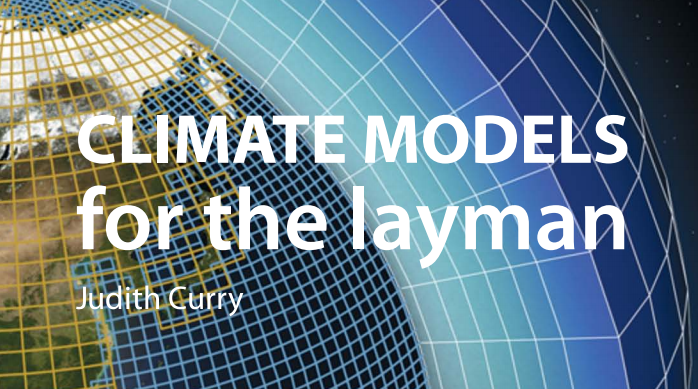 Judith Curry has written a new paper, Climate models for the layman, published today by the GWPF. She hasn’t done a blog post about it, nor has anyone else as far as I can see, so here’s a venue to discuss it. The aim is “to describe the debate surrounding GCMs to an educated but nontechnical audience”. century climate will actually evolve. The first section explains what climate models are and how they work, emphasising that some physical processes are approximated and/or can’t be represented on the coarse grids used, and that this inevitably requires the modellers to make choices, which influence the results. Part 2 discusses why some scientists have confidence in the models and some don’t. A key point here is that because of all the parameter choices, it’s fairly easy to tune the model to fit fairly well with whatever 20th century global temperature data set you like, but this does not mean that the model has any useful predictive skill. Section 3 looks at climate model failings, such as the failure over more than 30 years to reduce the uncertainty in climate sensitivity. She also mentions the inevitable predictive failure of models due to the chaotic dynamics of the nonlinear fluid dynamics — a small change in the starting values leads to a large change in the future climate (the ‘sensitive dependence on initial conditions’ hallmark of chaos). The last section builds on the unreliability of climate models for predicting what’s going to happen over the next century, commenting on the IPCC’s own acknowledgement that the models are running too hot, and noting a “troubling inconsistency” in AR5 WG1 in lowering near-term projections but leaving longer-term ones at a higher level. As Bishop Hill always used to say, read the whole thing. Tags: Curry, science. Bookmark the permalink. A key for me is the importance of global temperature in assessing performance and in predicting the future. Global temperature even with error bars just does not begin to describe how these changes affect us. As I am in the habit of saying, CET records show stability in British temperatures over a long period of time, albeit with a little bit of warming in Autumn and Winter. I hope squirrels and moles and hedgehogs can cope. If the extremes happen in places with few animal species and hardly any vegetation, who cares? So the inability of the models to recreate zonal climates invalidates them. When I look at the graph on page 18 of the two model outputs it seems to me that there is no sophistication at all. Apart from a few downward spikes for what I assume were volcanoes, the plot is little more than the CO2 times a multiplyer. Most of the features of the real temperatures are missing. There’s no upward spike in 1875. In the models there was a sharp and prolonged downturn in 1885 but in reality there was no such feature. It doesn’t show the temperature slide from 1875 to 1910 or the rapid rise from there until 1940. It misses the deep dip around 1905/10 and any of the big swings between 1930 and 1960. And of course it doesn’t account for the pause. There was no SO2 spike to explain the lack of rising temperatures. Call me an idiot but those wiggles probably mean something. They’re not just a bit of noise that overlays a climate driven by just CO2 and SO2. And if climate was just CO2 and SO2, why would we need all those very expensive models? And all those scientists? The wiggles have all the information when indexed by latitude! This ‘Weather\Climate’ is 10% statistical, 13% chaotic, and 77% deterministic. Let the skilful ‘weather forecasters’ separate out the deterministic; for advice on when to hide, and which way to flee\fly! S**tcan all academics that attempt to scam others with the statistical! Michael, it is now, and at WUWT, but Cliscep was first! the author quotes changing the initial conditions by a trillionth of a degree and ending up with completely different output. Any layman can see this is useless. How do they get away with it? When I studied atmospheric physics in the 70s, global climate models brought smiles to people’s faces since the models could and did do just about anything, a bit like heavily disguised random number generators. Oh how the smiles would have been wiped from our faces if we’d known just how successfully models were to become pampered and promoted as political props for destructive, inhumane people bent on, how did Strong put it, bringing about the collapse of industrial society. That has proven an exciting and lucrative pastime for a few people, and they have had influence out of all proportion to their merit, or to the merit of their scaremongering. Thank goodness some in climate science kept calm, and have continued to point out the realities of our still-modest understanding of the climate system and our even more modest ability in modelling it. Judith Curry, and the GWPF, deserve our gratitude for this new work that could encourage more people to take a more critical view of what the software can and cannot do for us. Actually, climate models are incredibly accurate. More accurate than our economic models, which is very impressive considering the economy is a man made phenomenon! I do not understand the confusion surrounding models of climate. Any and all models must be tested to determine whether the model works or is accurate or has predictive “skill”; this includes mechanical, mathematical or computer-generated models. The type of necessary testing depends on the type of model: Climate models are predictive ones and so can only be tested in the future. Mimicking the past or present proves nothing about the accuracy of a predictive model. I note that figures 5-7 in Curry’s article are for “All RCP’s”, i.e. including RCP2.6 and 8.5, neither of which has a realistic chance of actually occurring. If you take out the implausible end-members, the range of projected temperature increase by the end of the century is rather small, between 1 and 3 degrees relative to the 1985-2005 baseline used. Geoff, Rice’s post is pretty much devoid of technical specifics. It is however long on polemics and mind reading. I noticed particularly the point about models running too warm. This is not really based on energy balance methods as Rice asserts. It is based on the historical record and even AR5 acknowledged it as Curry points out. A good addendum here is Nic Lewis’ writeup on ECS which in the later parts deals with GCM’s and convection and clouds, making some very inconvenient points for the GCM defense team. Tom, Yes, but the problem here is that as Nic Lewis points out, ECS an be engineered over a big range by tuning parameters that are not constrained well by data. I would characterize this as structural instability and should give people a lot of pause. Thus, the real uncertainty range for the GCM’s is vastly larger than shown in the figures. I have a feeling that Judith will be criticized as much for where she published this as for what she wrote. What she wrote is pretty non-controversial. ATTP: Well, yes, this is probably true. ATTP: This appears to relate to the fact that the system is non-linear and, hence, chaotic. Well, that it is chaotic does not mean that it can vary wildly; it’s still largely constrained by energy balance. Judith: The climate model simulation results for the 21st century reported by the Intergovernmental Panel on Climate Change (IPCC) do not include key elements of climate variability, and hence are not useful as projections for how the 21st century climate will actually evolve. ATTP: This seems to be complaining that these models can’t predict things like volcanic activity and solar variability. Well, unless we somehow significantly reduce our emissions, the volcanic forcing will probably be small compared to anthropogenic forcings. ATTP closes with: The real problem with this report is not that it’s fundamentally flawed; it’s just simplistic, misrepresents what most scientists who work with these models actually think, and ignores caveats about alternative analyses while amplifying possible problems with climate models. Climate models are not perfect; they can’t model all aspects of the system at all scales, and clearly such a non-linear system could respond to perturbations in unexpected ways. Thomas, thanks for doing the detailed leg work. I still think that the strongest arguments are given by Nic Lewis. There is a lot of evidence of structural instability which really just blows any credibility out of the water. At least the SA turbulence model is not so unstable. The whole issue with GCM’s is really odd in the Climate Wars. I have not seen any deep technical defense of them that is actually credible other than “every time I run the model I get a reasonable climate.” That was Gavin Schmidt and is not really credible. The recent paper on model tuning was laudable in bringing out some of the issues. What happens then is that people who don’t know a lot about the technical details develop justifications such as (from ATTP) “they are a tool for understanding the climate system.” That’s true as far as it goes. However, we really do need more than qualitative understanding if we want to make smart choices. GCM’s do have their place especially for weather forecasting. Understanding their long term behavior is an area of deep uncertainty I would say. Curry is pretty knowledgable in the area and makes some good points. I disagree! Such is not for understanding the climate system. The current GCMs are onlyused to demonize fossil fuel, (used to be coal for stationary power generation). She has good understanding of the political implications, and uncertainty! Curry seems to lack skill to distinguish science from non-science! The GCMs have never been tested for even repeatability, let alone regression to past error. The basic assumptions of how this atmosphere interacts with electromagnetic flux are ridiculous. The folk building\maintaining the GCMs were well informed by those doing measurement, not research, back in the 70’s that such assumptions are ridiculous! Will, Some of what you say is true. However, it is also true that GCM’s do do a reasonable job of foresting weather in most situations. Rossby waves seem to be reasonably well resolved at least for a few days. i do agree that the longer term calculations done as they are on coarser grids an area of deep uncertainty. I would also point out that Nic Lewis cites some studies of cloud and convection parameterizations that show that varying their parameters does show us the high sensitivity of GCM results to those parameterizations. I would call that “understanding” albeit an understanding of the limits of the models. So I would argue that GCM’s can in principle help us understand where to focus future research and measurements. Weather forecasters are very skilled at distinguishing the deterministic from the statistical\chaos! They are even better at realizing the limitations of there skills! Those folk do not use GCMs to do that job, but use every science trick they can find. OTOH the folk feeding the GCMs NASA\NOAA\NCAR have no understanding of thermal EMR, thus have nothing on which to base claims of “greenhouse effect” of “radiative forcing”. These folk are so inept, as a group, they cannot calculate the mass of Earth’s atmosphere, why it is now that amount, or what it might have been during ice ages! High time to introduce some ‘science’, any science, into the propaganda. Thomas, that is one of the strange aspects of the climate debate. There is little fundamental disagreement about the evidence or the models. However, one camp feels that uncertainty is so dangerous that we should destroy capitalism to ward it off. The other side says why not wait until we have something more than a glimmer of an insight before we act? There is absolutely no evidence of catastrophe waiting just around the corner. But that’s not how the models are sold to politicians. They are the ‘proof’. TinyCO2. When ATTP says Judith ” … while amplifying possible problems with climate models” he is just wrong. If anything scientists tend to minimize problems with climate models. Its the same in most fields of science where there is selection bias and positive results bias. That’s of course a critical point.